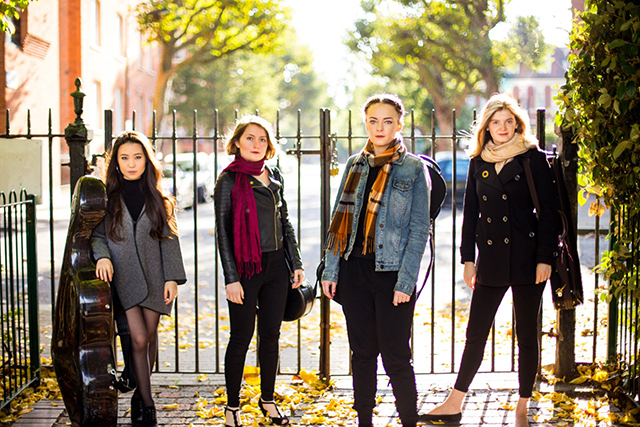 Formed in September 2012 by four musicians at the Royal Academy of Music, the prize-winning Halcyon Quartet has quickly established itself as a passionate, engaging and dedicated ensemble. Currently under the tutelage of Jon Thorne they are in their fourth year on the Academy’s prestigious Davey Posnanski Quartet Scheme. In addition to this they have worked with a number of distinguished musicians and groups including Sylvia Rosenberg, Levon Chilingirian, György Pauk, Garfield Jackson, Richard Ireland and the Doric, Heath, Escher, Skampa, Chilingirian, Fine Arts, RTÉ Vanbrugh and Wihan Quartets. The past year has seen the Halcyons perform many high profile concerts including performances alongside Alison Balsom at Dartington International Music Festival, Schumann’s Piano Quintet for the Royal Academy of Music’s Leipzig Series and as part of the British Museum’s ‘Music of the British Landscape’ Series. Recently, they were awarded the 2017 St. Peter’s Prize and have also won the Sir Arthur Bliss and Harold Craxton Prizes. Previous engagements have included performing in the Tessa Fuchs Recital Series at the Halesworth Arts Festival, being the Resident Teaching Quartet at Dartington International Music Festival and performances at Wigmore Hall, Colston Hall, Magdalene College, Cambridge, and at the Royal Academy of Music as part of the Russian, Mozart, 400+ and Lunchtime Concert Series. In July 2015, the Halcyons made their debut on BBC Radio 3 performing as part of the BBC Proms Composer’s Portrait featuring Hugh Wood and, more recently, at Eaton Square, as part of their 2017 Concert Series. In addition to performances in Dorset, the Halcyons will return to Eaton Square in the fall to complete their final concert as 2017 St. Peter Prize winners.